Last year the GSPCA helped a poorly, nervous stray cat that was covered in scabs. As no owner could be found Durand as he was named was cared for and treated by the team at the GSPCA. Durand was quite nervous when he first arrived but with a lot of TLC and vet treatment he improved daily. 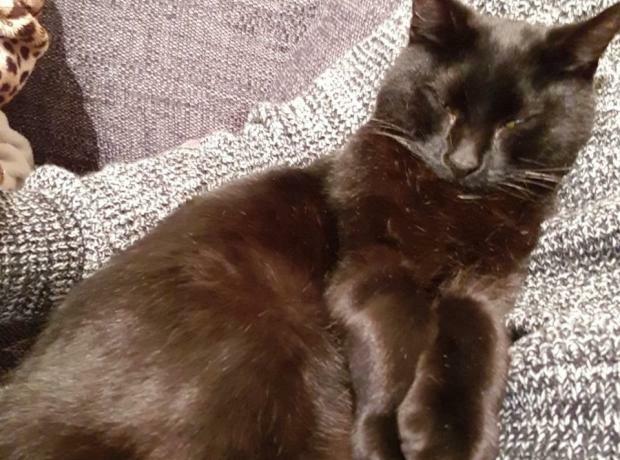 Last month Durand finally found his forever home and we have recently had a message from new owners Lewis and Laura to hear how well he is doing. With over 1000 cats helped at the GSPCA every year we strive to do everything we can for the many strays, cruelly treated and unwanted cats. At the end of August a 6 year old female cat found her way to the GSPCA when her owner could no longer care for her. Although in fairly good health on the day she arrived during her assessment we discovered she had cat flu and also had sores on her feet. After two months of treatments and veterinary care 'Lucky' as she is called improved and got better.